Patient expectations and care extend past discharge — how can you accommodate? 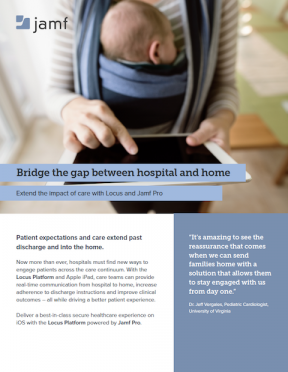 Now you can bridge the gap between hospital and home with the Locus Platform and Apple iPad powered by Jamf Pro. With this offering, care teams can engage patients across the care continuum and provide a better patient experience— even after discharge. Download this product brochure to learn how your healthcare organization can extend the impact of care with Jamf Pro and Locus Health.